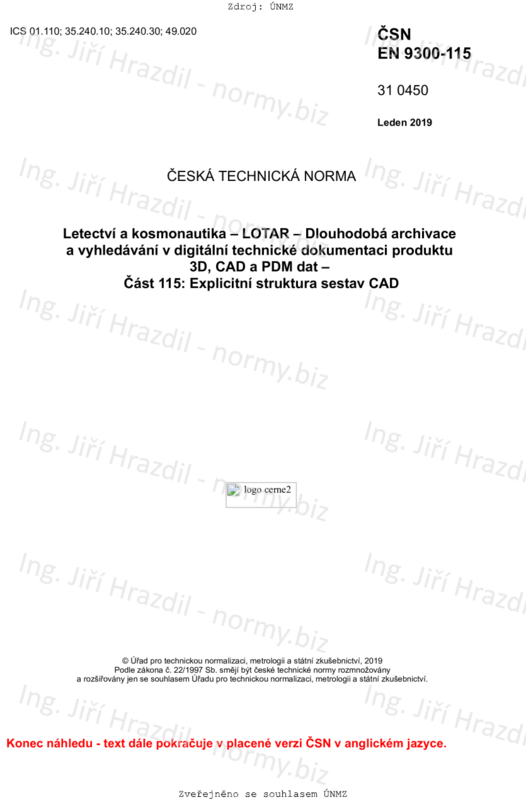 EN 9300-115 describes the requirements, and particularly the information required, for the long term archiving and retrieval of a mechanical CAD explicit assembly structure. This will allow the retrieval of the assembly structure including the placement information. The CAD assembly structure defines the collection of CAD parts into assemblies, and assemblies into higher level assemblies. An assembly can contain several occurrences of the same part or subassembly. The assembly structure is a tree, in which the leaf nodes are individual parts, and the non-leaf nodes are assemblies. The parent/child relationship between two nodes records not only that the child is part of a higher assembly, but also the relative position of that child in that assembly. This standard covers the archiving of the tree structure and the associated positioning information. The geometry of the individual component parts is out of scope. The assembly structure can be recorded in the same file as the geometry, or can cite the geometry as an external reference. The assembly structure can be supplied as a single file, or as a set of files, with cross references between files. NOTE 1: An assembly node may contain geometry that is defined directly in the coordinate system of the assembly rather than through a child node with a corresponding transformation matrix to move the part into the assembly co-ordinate system. Some modeling systems call this a hybrid assembly. This kind of assembly is within the general scope of this part; however no specific verification and validation rules for this geometry are defined. - The archiving of assembly Form Features. NOTE 2: Product assembly structure may be defined based on the data base management system approach. This case uses other fundamental concepts not covered in this part. See family EN 9300-2xx.